Manchurian is one of the Indo-Chinese recipes that we all love. Basic Manchurian balls are made from cabbage and carrots, but we can make variations as we want. Other types of Manchurian recipes you can make are Spinach Manchurian, Babycorn Manchurian, Mushroom Manchurian, Cauliflower Manchurian. 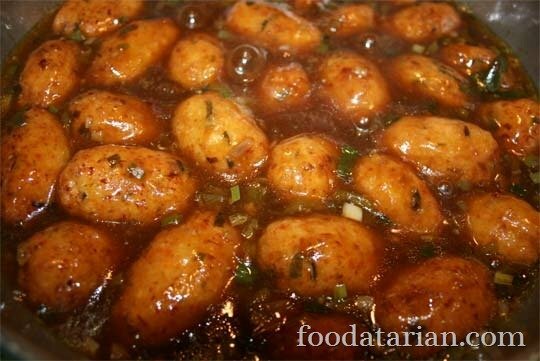 Manchurian could be a dry preparation served as appetizer or with gravy served as the main course. This is a Vegetable Manchurian gravy recipe. Any vegetable oil for deep frying. Combine all the ingredients for Manchurian balls and knead into a dough like mixture. Grease fingers and palms with some oil and make balls. I made around 32 balls from the above mixture. The number may differ upon the size of the balls. Meanwhile place a wok on a low-medium flame and heat oil in it. Once all the balls are rolled and oil is hot (not smoking hot). Drop a small piece of the mixture into the oil and if it surfaces to the top of the wok, then the oil is at the right temperature. 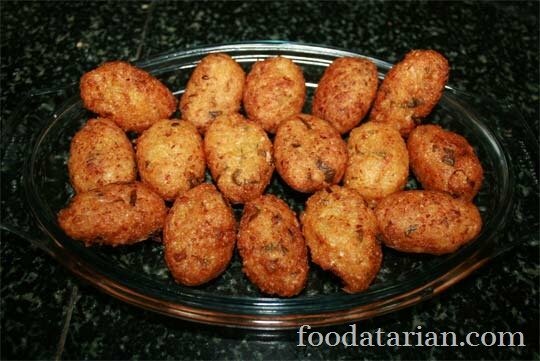 Drop few manchurian balls into the hot oil and fry them at a golden brown color and crisp texture (see picture below). Drain them on paper towels and fry the next batch. When all the manchurian balls are ready, we will prepare the sauce. If using the same vegetable oil, reduce the quantity of oil in the wok to up to 1/4th cup, else in another wok heat olive oil on a low-medium flame for a minute. Add chopped ginger and garlic and sauté on low flame until fragrant. Then add peppers and scallions and stir fry on medium flame. Then add soy and chilli sauce and combine. Add some water, enough to prepare a medium thin gravy. Then add salt (soy sauce has some amount of salt in it, so adjust as per taste), sugar, vinegar and stir. Stir in the manchurian balls and let the gravy simmer for a few minutes. This way all the sauces and flavors will be incorporated in the manchurian balls. In the end, add the corn flour paste, stir and you will find the gravy thickening instantly. Turn off the flame and serve hot over noodles or boiled rice. NOTE: The sauce in this recipe is not very thick, so that it could be eaten with rice. 1. Fried Manchurian Balls can be served as a snack or appetizer (starters). 2. The sauce can be very thick and lesser in quantity (reduce the amount of corn flour paste) to prepare a dry manchurian.